We love a challenge and we're here to prove that hosting a holiday cocktail party in a small space is not only doable but can be totally chic as well. Here, we take a look at a variety of space-saving and moveable bar set-ups as well as the stylish bar accessories you'll need to mix all those holiday cocktails for your friends and loved ones. The NewYorker is a savvy bit of furniture by designer Jen Turner that is a desk by day and a bar by night. Meant to evoke the drink trolleys of yore, the NewYorker was designed to offer business up front and a party in the back. Here we present the fine bit of decor in all its dual-function, space-saving glory. We're betting your studio apartment didn't come with one of these. The light and airy design of Block Table, created by Danish designer Simon Legald, offers a fresh take on the familiar tray table. Outfitted with wheels and four handles extending from the legs, it is easy to move around as well as highly versatile. May be used as a bar cart, side table, tea table, coffee table or bedside table. Designed by Alvar Aalto in 1936, the Tea Tray 901 is a surprisingly contemporary take on the bar tray. The sculpted, natural lacquered birch frame is paired with two shelves and white lacquered MDF wheels with black rubber rings. Mobile and captivating, the Tea Tray is perfect for taking your tea— or other beverage of choice— on the go. Designed by Zürich-based designer Alfredo Häberli, the Happy Hour Trolley is suitable for a wide range of functions— not just to hold your favorite beverage. Its chromed iron structure make it ideally suited for use as a side table in the living room or for additional storage in the bathroom. Tripod wheels make it an adaptable piece for any home. Here's the gigantic splurge of the bunch—a compact, stylish bar from the Scandinavian designer Gesa Hansen, who bases her company and atelier, The Hansen Family, in Germany. But no matter—look at this thing! It's a hand-crafted solid oak trunk that opens to reveal a home bar, inspired by 19th century traveling trunks. 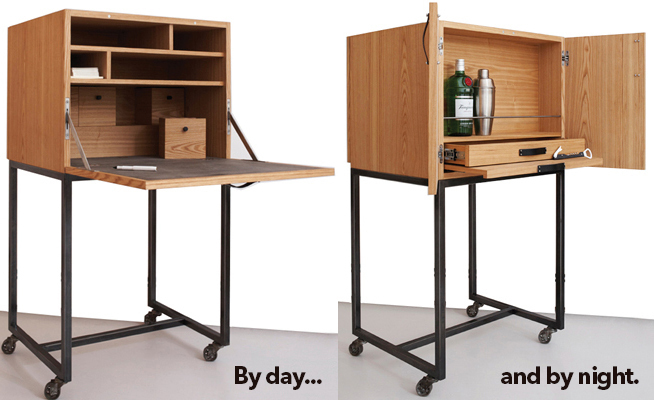 Once you've got your space-saving bar cart/trolley/trunk chosen you'll have to stock it with all the right tools. Created by designer Brendan Ravenhill with the ultimate functionality in mind, the Bottle Opener in walnut wood features two magnets: one to adhere the opener to the refrigerator door (or any metallic surface), the other to catch the bottle cap. A design innovation worth a round of cheers. Modern and playful, the Ice Bucket is designed and hand-sculpted by Tina Frey in San Francisco. Made from shatterproof and food-safe resin, the Ice Bucket’s clean modern lines are complemented by organic and supple leather handles making it easy to carry. London-based designer Ron Arad has definitively answered the age-old martini debate “olives or a twist” with a sleek, sculptural response. The innovative design and unique twisting shape ensure cocktails are chilled to perfection. Fluid and elegant, bold and functional, Göran Hongell's Aarne barware collection epitomizes timeless style that trancends the trends of the moment. Aarne barware quickly became the standard for essential barware in the 1950s, and it remains just as essential today. An exploration of the lost art of mixing the perfect drink, this handy guide is a must-have for entertaining novices and pros alike. With recipes for such favorites as the Brandy Alexander, Sidecar, Pimms Cup and Gimlet alongside mouth-watering photos of each drink taken at the famed Carlyle Hotel.